Keystone XL campaign for the win. Campaigns are often controversial and the Keystone XL campaign is no exception. You would be hard pressed to find a pundit or an analyst that doesn’t have thoughts on it one way or the other. In and of itself, that is important. North America desperately needed a conversation about our energy future. Love it or hate it, the very fact that opinions are strong and debate has been generated have made this campaign a success. Giant tar sands infrastructure will never fly under the radar again, and you can expect political chatter around major energy projects for the foreseeable future. But beyond the important generation of debate, and the critical role the campaign has played in building a movement of citizens demanding a cleaner, safer energy future, the campaign is also poised to have a very real and measurable impact on carbon pollution as well as the tar sands industry’s bottom line. A new report from the Institute for Energy Economics and Financial Analysis and Oil Change International shows that tar sands production revenues were down about $30.9 billion from 2010 through 2013, in part due to the changing North American oil market but largely because of a fierce grassroots movement against tar sands development. The report attributes 55% of the lost revenue, or $17 billion, to the diverse citizen protests against pipelines and the tar sands. To be clear – the point of the campaign is not to bankrupt the oil industry, it is to protect our climate, and anything that depends on it (i.e. everything), as well as support the front line communities that face the impacts of this industry every single day. It just so happens that if your business model is predicated on rapid expansion of some of the world’s highest carbon oil, then having an impact on your bottom line is one way to keep carbon in the ground. With momentum continuing to grow around pipeline campaigns, it is not a leap to imagine that every major tar sands pipeline could be held in limbo for years to come (just look at the hurdles facing Energy East and Northern Gateway). If this were to be the case, by the time 2030 roles around, our modelling shows that tar sands production would still be hovering around projected 2015 production levels. A no new pipeline scenario would mean up to 6.9 billion barrels of tar sands oil could be left underground by 2030. In other words, if no new pipelines are built, our forecast predicts that an additional 4.1 billion tonnes of CO2 will be kept in the ground. Spread over the 16 years of this forecast, these emissions are the equivalent of the emissions from 67 average U.S. coal plants or nearly 54 million average passenger vehicles. In a world where two thirds of known carbon reserves have to stay underground, this is a huge deal. These numbers also don’t account for the cold feet that investors are already getting as they begin to come to terms with the bleak future of the tar sands. 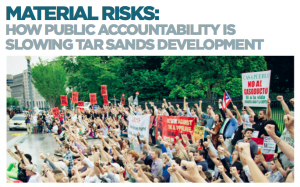 Capital flight is already a problem, and three major tar sands projects have been put on ice in 2014 alone. In a world that needs to ease off carbon, high carbon, high cost, and high risk tar sands are becoming less of a frontier and more of a case study of an industry poised for collapse – a much bigger problem than losing over half of their growth potential. The tar sands industry and some governments haven’t been doing themselves any favours by using the same microphone to reiterate the critical need for pipelines followed in the same breath by statements that pipelines are not such a big deal given the potential for rail. These irreconcilable positions boil down to the reality that no serious expert believes that rail can act as anything more than a short term stop gap. The growth of the tar sands and the false confidence industry portrays is doing everyone a disservice. The tar sands are on their way out of style in the rapidly evolving global energy market, and we have a lot to thank the Keystone XL campaign for kicking this reality to the forefront of a continental debate so that we at least have a fighting chance to get ahead of the game. Where industry and government would have driven us blindfolded off a cliff, the Keystone XL campaign has opened our eyes and prompted a debate that we desperately needed. And at the same time, the Keystone XL campaign is buying us critical time by keeping climate changing carbon in the ground while slow-moving governments and industry come to terms with the end of an era. It’s not over yet – but if we can keep the pressure on it is looking like Keystone XL campaign for the win. “the point of the campaign is not to bankrupt the oil industry” – gosh, that’s a relief! No point in bankrupting the industry that’s destroying the earth and its creatures, with Exhibit A in Alberta, Canada, now, is there?! Not one word here about alternative pipelines, about indigenous people’s suffering and on-the-ground courageous opposition. And what about the southern leg of the KXL?! Please help stop the Bakken pipelines too!